Holland Cotter, the co-chief art critic for The New York Times, spoke of his relationship to art in exceptionally personal terms on March 9 as part of the University’s Dodransbiecentennial celebration. Lynn Neary moderated the Q&A. 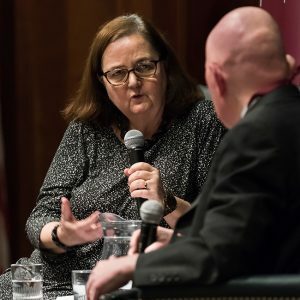 In a lecture and Q&A with NPR arts correspondent Lynn Neary, TMC ’71, Cotter took listeners on a decidedly spiritual journey on how he developed his views on art, though he said he prefers the term “emotional” over “spiritual.” The sapientia et doctrina event was sponsored by the Center on Religion and Culture. 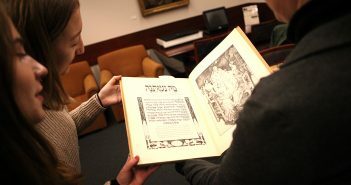 Cotter said that several religious motifs surfaced as high marks in his experiences with art. He said the highlight of a recent trip to Mexico City was not the galleries, but seeing the Virgin of Guadalupe–as much to observe fellow pilgrims as to view the work of art itself. Cotter contextualized his views by providing a candid look at his background and growing-up experience. Born in Weston, Massachusetts, not far from where Henry David Thoreau lived on Walden Pond (and where Cotter’s father on worked as a lifeguard), Cotter said the writer became his early hero. 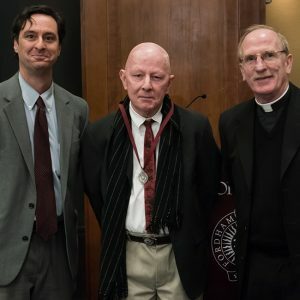 James MCCartin and Father McShane present Cotter with the Sepientia et Doctrina medal. At Harvard College, the English literature major fulfilled a science requirement by taking an anthropology course called “Primitive Art,” he said, at a time when the study of such art was rare. “I loved everything about it,” he said of his college anthropology course. He also recalled the first time he saw “art that ‘did’ something”—a video of a masquerade dance in Mali. He said well before performance art “became a vanguard art here,” it existed in other cultures. After college, Cotter said he got a hospital job as an orderly. That visceral experience left him with a sense of mortality which profoundly influenced the way he looks at art. It clarified his affinity for art that deals in life and death, such as religious artifacts, African sculpture, or art from the AIDS epidemic. He came to New York City in the 1970s, when the South Bronx was producing significant strides in art through hip-hop and graffiti, he said. He lived downtown where he “cobbled together a freelance base” to begin writing about art. In the early 1980s, when “caution replaced creativity” in the art scene, a show at the Japan Society inspired Cotter to visit Japan, touring monasteries and escaping the growing commercialization of the art world. He said the trip confirmed for him that, while he may not have a religious temperament, he did have a “pilgrim’s temperament.” On returning to New York, he got a job at the City University of New York’s computer center. The position allowed him to take graduate courses at Hunter College. Later, he attended Columbia University. He delved into the art of ancient Greece, the art of Islam, and of Turkey. He recalled one teacher who showed an hour and a half slideshow depicting mosques from Africa to Queens, New York. She said very little during the presentation, which ended with an image of an elderly couple seated on a sofa. 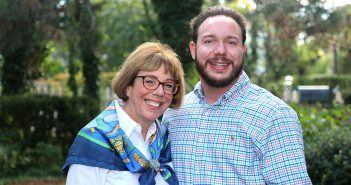 “These are my parents,” Cotter said she told the students; by showing the image after so many artistic treasures, his teacher reminded students of the humanness of art that sometimes gets lost in a gallery setting. “Art is made by people,” he said.